This is just a quick post for a quick project, but I do discuss pattern issues. I signed up to volunteer at a local historic house museum as a docent for their Halloween program on Victorian mourning. I’ve been helping them set up the exhibit (and handle the collection!) 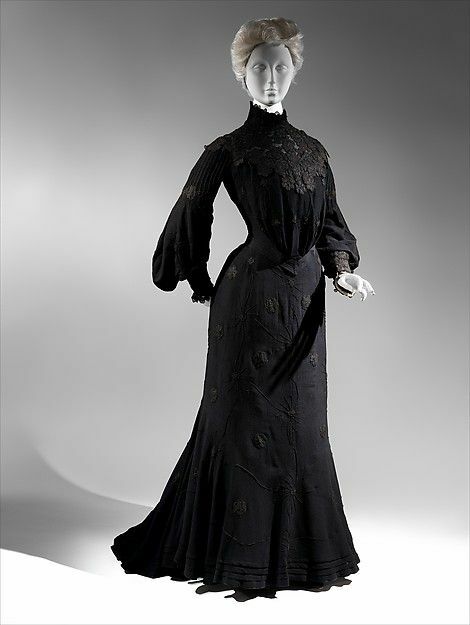 and most of their extant garments are very late Victorian and early Edwardian. In particular, they have several pigeon-breast blousewaists, so…it was time for me to try Edwardian! Unfortunately, they don’t have a good hi-res photo, but you get the gist. I wasn’t going too fancy or detailed anyway; the important part is the sinuous shaping of the sleeves and blouse. If I’m going weird, I’m going full weird. I bought a drapey wool challis for the main fabric and some polyester lace (which, thank god, was the SAME UNDERTONE despite both being bought online….) and used the Truly Victorian E41 1903 Blousewaist pattern in combination with the TVE22 1905 Circular Skirt pattern. For the bodice, I added a panel of pleating to the front and overlaid a yoke of lace at the top – I didn’t have the time to fiddle with modifying the actual pattern to include those. A lot of handstitching went into this! Truly Victorian is normally very kind to my body shape – I usually fit the straight size on the first go. But this was a little small (torso length, sleeve length, and across the back – pretty much everything). It fits like a glove, and that’s after I lengthened the sleeves with a diagonal lace inset and lengthened the back placket! Ah, well. For the skirt, I added the recommended bit of self-fabric trim. Before I hemmed it, I realized that it came up a bit short (I had the same problem with the 1893 Bell Skirt – I’m only 5’6″, but I do wear heels with these skirts). I ended up adding a bias strip to lengthen the hem before I faced it. I used a 4″ shaped facing and enclosed 3″ horsehair braid inside of it, which added greatly to the body. Left photo was a try-on without any support undergarments. This is the first historical dress I’ve made that actually fit without them! The blouse actually looks better without my corset, because my current one bushes my bust up too high, haha. The middle and right photos (I’m at the left in the latter, speaking to a group) were during the event. The final dress was worn over the TVE01 1903 Edwardian Corset, TVE02 Edwardian Underwear (though not the corset cover – I tried, and it just put too much bulk in the blouse. Maybe when I make it a size larger…), a pair of hip pads, the TV bum pad, and two Black Snail Patterns bustle petticoats (one cotton lawn, one silk taffeta).